The volume edited here is the earliest churchwardens record known from the diocese of Derby. It is also the earliest parish record of Derby, a borough whose history, especially in the early modern period, remains obscure. About a fifth of the book was published by J.C. Cox and W.H. St John Hope in 1881. The authors selected extracts on the basis of their own antiquarian and ecclesiological interests and were not concerned with it as a record of parish administration in an urban community. This edition of the whole of the manuscript reveals the development of parish administration over two centuries in which the parish greatly increased in importance as a unit of local government. The volume contains not only inventories of church goods, rentals of parish lands, and details of repairs, alterations and improvements to the fabric of the church, but also records the working of the poor law and charities, and the repair of the highways. Historians of early modern towns have often seen their subject from the stand point of the council chamber, not the vestry. This is not possible in Derby, whose corporation records are largely lost. This volume redresses this imbalance by exploring in detail the range and efficiency of parish administration in an important Midlands borough. Richard Clark, a graduate of Worcester College, Oxford, has worked for many years on the history of early modern Derbyshire and is a longstanding member of the Record Society committee. 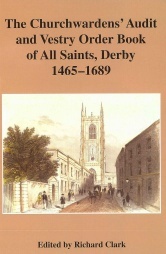 The books cover features a view of All Saints, Derby now the Cathedral from St Marys Gate, c.1840. Image courtesy of Derby Local Studies and Picture The Past.